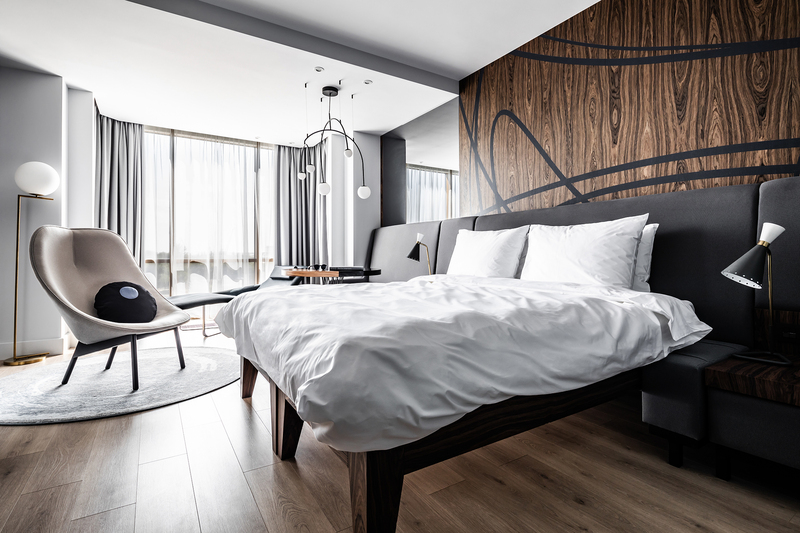 To update the design for the Radisson Blu chain brand, but to keep the expensive materials used in the original interior by integrating them into the new design. There are only 80 rooms in the hotel, and they are architecturally different. We were asked to update the interior of the bathrooms while keeping the marble. In the hotel’s public spaces, we needed to keep the onyx and the marble floor. And we had to propose a completely new solution for the restaurant. It was important to adapt to the existing details while bringing all the spaces together into one balanced and memorable interior. 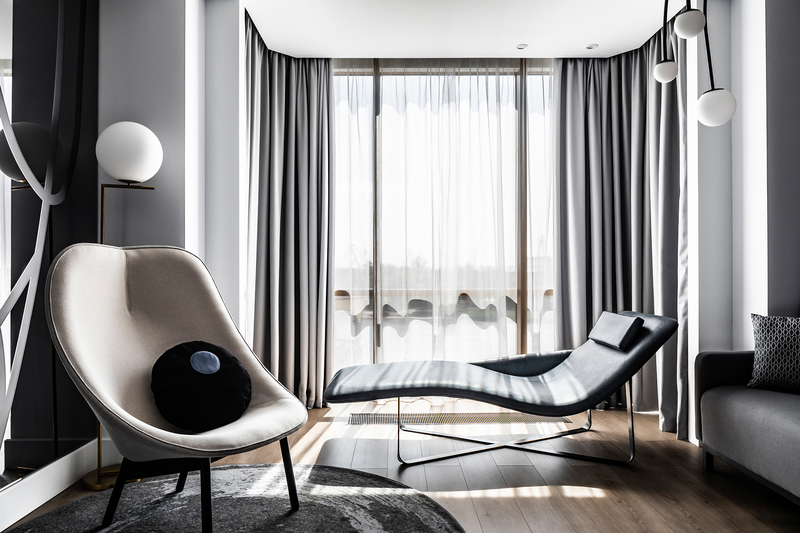 The hotel’s location on the central embankment of the Don River and its favorable architecture – the floor-to-ceiling windows in the lobby, restaurant, and guest rooms face the river – are the elements we played on in the new interior. In order to attract the attention of both hotel guests and passers-by, we created a light installation artwork in the reception area. It is a brass spiral that gives off a warm light. It can be seen from the entrance hall, the lobby, the restaurant, and the second-floor elevator hall. We placed a steam fireplace in the center of the lobby. It is easy to use and serves as an air humidifier, and it also creates a cozy and warm atmosphere. We also emphasized the rounded layout by adding a large semi-circle rug, pocket sofas, huge rounded armchairs, and a rounded bar counter. 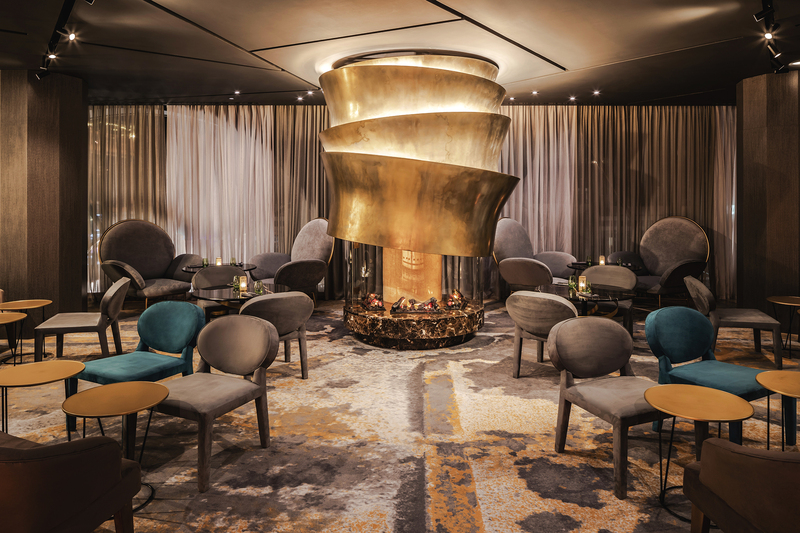 We kept the onyx details in the bar, but somewhat changed the geometry of the area: we moved the bar counter out further into the room, added some metal and mirrors that expand space and contrast with the restrained color palette of the lobby, drawing the guests’ attention to the bar. 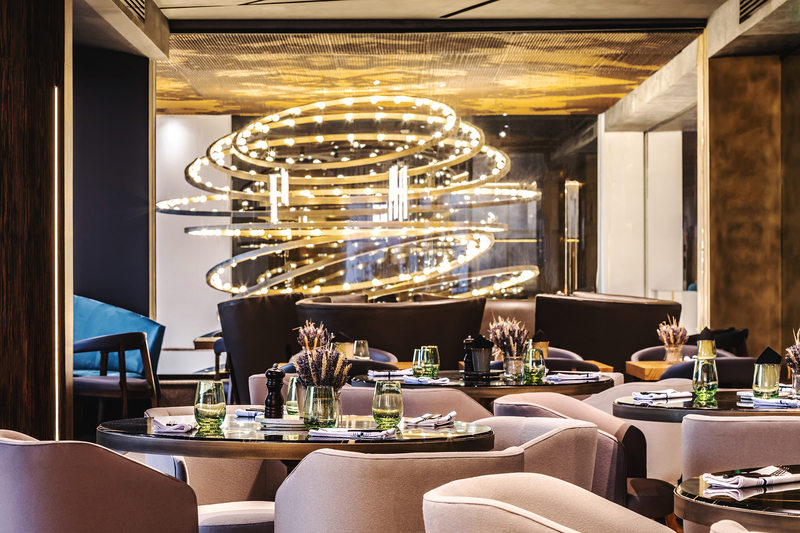 The bar’s revenue is an important part of a hotel’s profitability, so it must be emphasized in a modern hotel interior to attract both the hotel guests and passers-by. We used the “fire-lake” concept chosen by the client to design the restaurant. There is a lot of wood in its interior: mosaic parquet floors, wood veneer with built-in lighting on the dining room columns, as well as details on furniture and tabletops. The arched windows are supported by the design of the open kitchen area and the decoration of the columns, the round central seating and pocket sofas along the windows with a panorama of the river. The rooms have not only different architecture, but also different views: some of the windows face the Don River, while others face the street. There are also different windows in some rooms. We used different color schemes for river-view and city-view rooms. We also considered the fact that some rooms have isolated sun-bathing decks. The hospital has only 80 rooms, but they are all very different. This solution allows us to create an atmosphere of intimacy and individuality for all hotel guests. We used simple, clear lines and natural colors in all the room designs, and we added bright color accents. All the furniture is unassuming, elegant, and timeless. We added a dark background with a graphic theme to the bathrooms to stylistically connect them to the rooms. The result was a modern, but not too trendy interior that will be relevant even 10 years from now. You’ll start getting emails from us shortly. Thanks for signing up! You’ll start getting emails from us shortly."